Halloween decorating is in full swing! Now that there is only one weekend left to decorate I'm busy getting everything made and up in my apartment. I keep coming up with new ideas and stuff to make, at this rate I should just put a sign out front and have a haunted house...just kidding I'm not going that overboard. It looks AMAZING so far!! I'm so impressed! Is that burlap?! Around your fp opening?! How?? 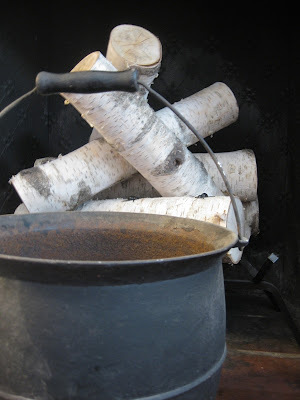 Also, totally digging the birch logs and cauldron! Where did you find it?! I always have a hard time deciding where to stop with the h-ween decor. It's tough to make it creepy and not go overboard, isn't it? 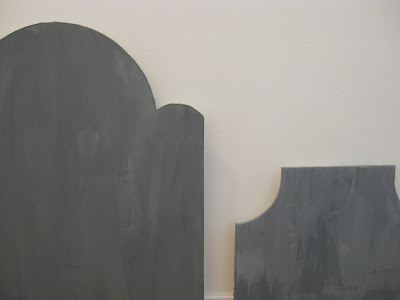 I love the tombstones! So amazing. Where did you find your crow? I have been looking everywhere! Great job! That crow is really spooky. Oh I think everything looks so great Linds. Can't wait to see all the decorations come together. How fun! Oh my, your decorations are reminding me that I need to get my buns over to Michael's! 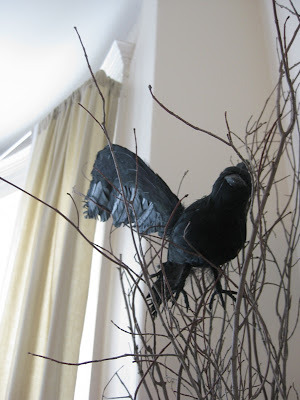 Lauren- the crow is from Homegoods. I've been to two other Homegoods since I got that one, and they all seem to have a few in stock. I hope you find some! wow!! that burlap around the fireplace is the best!! I want details!! 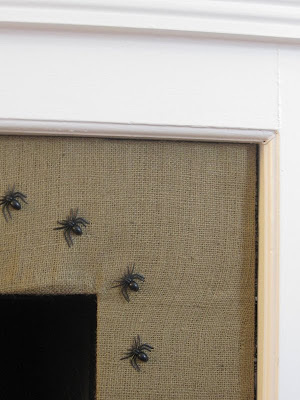 Loving the spiders on your newly covered fireplace--you're so creative! It looks great! My favorite has to be the candle and the spiders on the fireplace. It all looks so great! Are you getting dressed up? Love the crow, I think you should have a haunted house! Ha! I was just telling my husband that we needed some decorations! Now I am inspired! love the spiders on the linen and the candle looks great! omg, I looooove the bird! so great!! spooky, but chic! OMG LOVE! Looks great! We love Halloween too! And Margaret...we agree...she looks better every time we see her. See you soon! Sooooo cute! I too love Halloween. Check out my "Gone Batty with Bats" post on my blog, Living it at home.